The TSLA stock price is up 8% this week and has now climbed more than 26% in the last month. And Money Morning experts see the TSLA stock price climbing much higher in the long term. Before we get to why we're so bullish, here's what has driven the Tesla stock price higher in March. Tesla Motors Inc. (Nasdaq: TSLA) shares have been trending higher along with the 9% recovery in markets since February lows. Momentum stocks like Tesla suffered during this year's global stock market rout. Tesla shares got a boost Monday after Dougherty Financial Group LLC test drove Tesla's Model X at the 2016 Geneva motor show and gave the vehicle a rave review. Dougherty was impressed with the vehicle's handling and said demand is not going to be a problem. 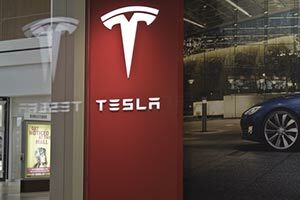 An upbeat Dougherty has a $355 price target for the TSLA stock price. Then Car Magazine wrote Tuesday that thanks to its futuristic looks, latest in-car technology, and fantastic features, Tesla's all-electric Model X "is quite possibly the most revolutionary SUV yet." The Model X is the newest addition to Tesla's fleet, and follows up on the Model S sedan. Key features include: "bird in flight" doors; an expansive curved windscreen with UV-protected glass that ensures the cabin doesn't overheat or get too cold; plenty of leg and cargo room; and an extraordinary infotainment system. The car boasts collision prevention systems and automatic emergency braking, active even at motorway speed. Tesla touts the $80,000 Model X as the "safest, fastest, and most capable sport utility vehicle in history." It has all-wheel drive and a 90 kWh battery providing 257 miles of range. And while the reviews of the Model X have sent the TSLA stock price higher this week, there's an even bigger reason why we remain bullish on Tesla stock. In late March, Tesla will unveil a new Model 3, but we still don't know a lot about the much-hyped car. "The first pictures of the Model 3 will be at the end of March," CEO Elon Musk said. "I am being a little coy here, we are not gonna show everything about the Model 3 until a lot closer to production time." Model 3 production is due to start in 2017. That means an unrestricted look at the Tesla Model 3 is still far off. But with a price tag of just $35,000, interest is expected to be high. The introduction of a $35,000 vehicle is huge for Tesla, because its Model S sedan and Model X SUV retail for $70,000 and $80,000, respectively. And with worldwide revenue from electric vehicles forecast to bring in $488.54 billion by 2030, Tesla stock needs an affordable vehicle to appeal to the masses. Money Morning Technical Trading Specialist D.R. Barton is bullish on TSLA stock and says it is "head and shoulders ahead in the electric car front." Still, with the kind of volatility Tesla and global markets have experienced this year, TSLA stock is not for short-term investors. But for long-term investors looking to buy and hold a stock for five to 10 years, TSLA is an excellent choice. Musk's unparalleled vision and ability to create innovative products have propelled Tesla to the forefront of the electric vehicle market.